Connections to a SAP Hana database require DataConnect version 1.13.1.1998 or better. If you have a lower version than this, please contact us to request and updated version. In addition you will need to have installed the Hana client software in order to get the ODBC drivers. You will need to install the version of the Hana client which is appropriate for your DataConnect installation, x64 if you have DataConnect x64, otherwise x86. The connection templates for Hana can be found in the ODBC connection type list. There are two entries, one each for x64 and x86. You should choose the entry which matches both your DataConnect and your Hana client installation. The value of DRIVER is fixed based on whether you have an x64 or x86 installation. The other values (apart from Schemas) you should be able to get from your Hana Studio connection details. SERVERNODE - enter the name or IP address of your Hana server followed by a : followed by the port on which the instance you wish to connect to is running. By default, the port number of a Hana instance is 3<instance number>15, so port 30015 is the default port of the default instance. UID - enter the username of the user you want to connect to your Hana server as. This user should have permissions to access the schemas and tables you wish to access in your queries. In addition, if you wish to access Attribute or Analytic views, this user must have permissions to access the _SYS_BIC schema. PWD - enter the password for the user. Schemas - enter a comma separated list of the schema(s) you wish to be able to access through the tile interface. If you leave this blank then the list of tables, views and procedures will contain everything that the user can see which could be a large amount of data and include system entities if the user has permissions on these. This restriction only applies to the tile interface, manual SQL queries always have access to any entity that the user can access. You can see here how both Attribute and Analytic views appear in the Views section on the left of the query window. 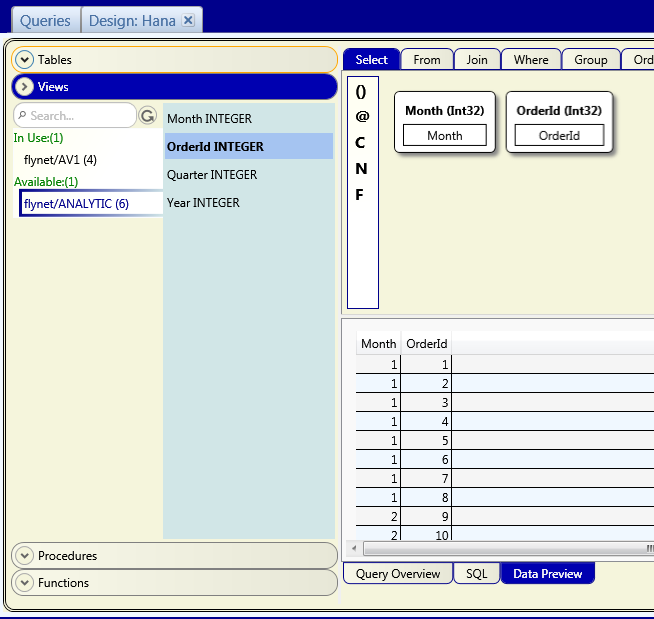 The name of an Attribute or Analytic view will include the name of the package in which it was created.